On November 16th, Metal Blade Records will release ”Skull Pit”, the debut album by American/Japanese collaboration Skull Pit! Skull Pit is a tale of two musicians from opposite sides of the heavy metal spectrum and the planet. Tatsu, hailing from Tokyo/Japan, bassist and mastermind behind the internationally acclaimed Doom outfit Church Of Misery. And Members from New York/USA, singer and frontman of German Thrash pioneers Exumer! The two veterans endeavored to combine their favorite elements of bands like Motorhead along with the countless outfits of the New Wave of British Heavy Metal into one blistering and highly energetic nine-track album. 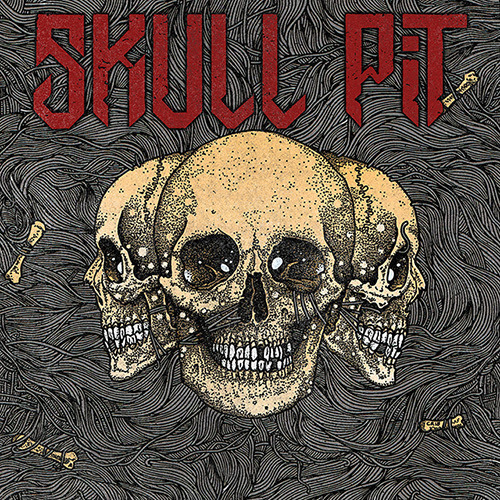 The songs on Skull Pit’s debut are a clear departure from what Exumer or Church Of Misery usually sounds like. Stepping away from Exumer‘s lighting fast rhythms and Church of Misery‘s slowed down Iommi inspired riffs, Skull Pit creates melodies in the vein of 70s hard rock and 80s NWOBHM with Lemmy’s punk attitude. Mixed in Tokyo by O-mi Kihara, ”Skull Pit”was recorded in New York and Japan during Exumer‘s and Church of Misery‘s time off from playing live around the globe. The result is a free flowin album that switches effortlessly between genres and boundaries but always with the intent to deliver a razor sharp riff or a memorable hook. Skull Pit didn’t shy away from further expanding their all-inclusive attitude when it came to choose and record a cover song as a bonus track; Rose Tattoo’s, “All the Lessons”. The song features Brian “Mitts” Daniels (ex Madball), who produced Mem’s vocal tracks in New York.